Berkeley Lab researchers observe 1D edge states critical to nanoelectronic and photonic applications; a new theory by MIT researchers could reduce number of sensors required for high-resolution imaging systems. The drive to develop ultrasmall and ultrafast electronic devices using a single atomic layer of semiconductors, such as transition metal dichalcogenides, has received a significant boost. Researchers with Berkeley Lab have recorded the first observations of a strong nonlinear optical resonance along the edges of a single layer of molybdenum disulfide. The existence of these edge states is key to the use of molybdenum disulfide in nanoelectronics, as well as a catalyst for the hydrogen evolution reaction in fuel cells, desulfurization and other chemical reactions. They explained that they observed strong nonlinear optical resonances at the edges of a two-dimensional crystal of molybdenum disulfide. These one-dimensional edge states are the result of electronic structure changes and may enable novel nanoelectronics and photonic devices. These edges have also long been suspected to be the active sites for the electrocatalytic hydrogen evolution reaction in energy applications. The researchers also discovered extraordinary second harmonic light generation properties that may be used for the in situ monitoring of electronic changes and chemical reactions that occur at the one-dimensional atomic edges. A new SHG imaging technique allows rapid and all-optical determination of the crystal orientations of 2D semiconductor membranes at a large scale, providing the knowledge needed to use these materials in nanoelectronic devices. 2D semiconductors are prized for their superior energy efficiency and capacity to carry much higher current densities than silicon. Only a single molecule thick, they are well-suited for integrated optoelectronic devices. 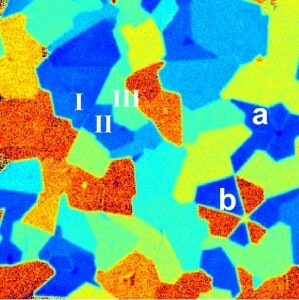 Until recently, graphene has been the unchallenged superstar of 2D materials, but today there is considerable attention focused on 2D semiconducting crystals that consist of a single layer of transition metal atoms, such as molybdenum, tungsten or niobium, sandwiched between two layers of chalcogen atoms, such as sulfur or selenium, the researchers noted. They contain the same flat hexagonal “honeycombed” structure as graphene and many of the same electrical advantages. As such, these transition metal dichalcogenides, unlike graphene, have direct energy bandgaps which facilitates their application in transistors and other electronic devices, particularly light-emitting diodes. Full realization of the vast potential of transition metal dichalcogenides will only come with a better understanding of the domain orientations of their crystal structures that give rise to their exceptional properties. Until now, however, experimental imaging of these three-atom-thick structures and their edges have been limited to scanning tunneling microscopy and transmission electron microscopy, technologies that are often difficult to use. Nonlinear optics at the crystal edges and boundaries enabled Zhang and his collaborators to develop a new imaging technique based on second-harmonic generation (SHG) light emissions that can easily capture the crystal structures and grain orientations with an optical microscope. 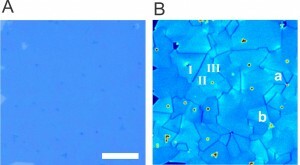 (A) Optical image of a large area of monolayer MoS2 and (B) an SHG image of the same area revealing grains and grain boundaries where translational symmetry is broken to form 1D edge states. Already familiar from airport security checkpoints, terahertz imaging has a number of other promising applications — from explosives detection to collision avoidance in cars, according to researchers at MIT who have developed a new technique that could reduce the number of sensors required for terahertz or millimeter-wave imaging by a factor of 10, or even 100, making them more practical. The technique could also have implications for the design of new, high-resolution radar and sonar systems. In a digital camera, the lens focuses the incoming light so that light reflected by a small patch of the visual scene strikes a correspondingly small patch of the sensor array. In lower-frequency imaging systems, by contrast, an incoming wave — whether electromagnetic or, in the case of sonar, acoustic — strikes all of the sensors in the array.